After checking online, i reached out to Arasu studio for a family function. They are highly profeasional, prompt in their responses and really trustworthy. I was impressed with the way they explained in detail about different quotations and helped me choose the right quotation for my function ( all through phone). Very nice photography work and everything s delivered promptly as promised. 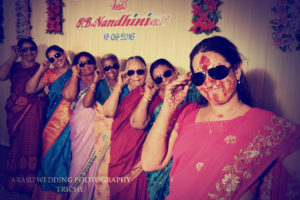 Arasu studio is definitely recommended for all kinds of photography needs. My wedding photography was done by Arasu studios. Excellent work on both candid and ceremonial pics. Drones were also used to get some unique shots. Friendly photographers and very receptive to feedback during album work. Along with wedding album and video, they also provided wedding pic calendar and framed photos. Great work on the whole. The team is awesome and very polite and very patience while during photography. They respect the customer need. Thank you team for accepting the request and doing the shoot in Vijayawada.